“What’s the downside to having a smartphone? There is none,” says the 13-year-old girl in “Screenagers,” a documentary recently shown at Annunciation Greek Orthodox Church in Akron. Along with Father Aleksa and Dr. Constantinou, Rev. Father Jerry Hall, parish priest at Annunciation, and Rev. Father Andrew Lentz, assistant priest, led a discussion for the parents and young people who attended the showing of the documentary. The movie by physician and filmmaker Dr. Delaney Ruston immediately puts out the numbers: The average teen spends 6 1/2 hours a day looking at digital devices, not including time spent doing school work or homework. Dr. Ruston, a pediatrician, includes scenes of those “negotiations” with her daughter, Tessa, who begs for a smartphone to replace her broken flip phone. Those are significant words, says clinical psychologist Laura Kastner. She increasingly sees teens who use their phones to avoid contact with others. Like other girls, Tessa would use her phone mostly for social media, while Dr. Ruston’s 14-year-old son, Chase, uses his mostly for games. Teenage boys spend more than 11 hours a week playing games. Not surprisingly, a discussion follows about whether video games desensitize players to violence. The answer might be found in history: The first games that involved shooting were made by the military to desensitize soldiers. With their overwhelming use of social media, girls face other problems. Peggy Orenstein, author of “Cinderella Killed My Daughter,” says teenage girls are “bombarded with images of appearance” and believe pictures of themselves must be heavily photoshopped to be acceptable. Again, not surprisingly, there follows the story of a girl named Hannah who was pressured by a boy to send a photo of herself in a bra. When she did, he asked: “Why did you send that?” and promptly shared it. The bullying that followed produced depression and dark thoughts. When she shared that she felt like killing herself, a so-called friend replied: “You should.” Fortunately, Hannah told her mother and received counseling. Many schools are giving their students laptops or tablets to help with homework and classroom assignments. But this is not a good thing, says Jacob Vigdor, professor of public policy at the University of Washington. One young teen in the film admits that while he uses a school-issued computer to do homework, he usually has three other devices operating at the same time: One for music, one for a movie, one for a game. While lauded in our society as a habit of smart, productive people, multitasking is actually impossible for our brains. It also deludes us, according to Dr. Sherry Turkle, who directs the MIT Initiative on Technology and Self. "What's extraordinary about the studies on multitasking is that even though you're doing worse and worse on everything, you feel as though you're doing better and better," she said. From an evolutionary perspective, early humans had to know everything going on their environment, said scientist Nicholas Carr, author of “The Shallows: What the Internet is Doing to Our Brains.” To “screen out” the environment by looking at a device “goes against our fundamental nature,” he said. Another problem is that our brains are wired for seeking behavior. When they “find” something, dopamine - a neurotransmitter that controls the brain's reward and pleasure centers - is released. People with smartphones are constantly checking them because they want that release of the pleasure-producing chemical, Carr said. But it was the story of the mice that stuck with many of the parents in the Assumption Church audience. Nino Ramirez, director of the Center for Integrative Brain Research at Seattle Children’s Research Institute, said mice exposed to bright, fast-moving images on screens took three times longer to make it through a maze than their non-exposed counterparts. More importantly, tests showed the mice exposed to screens had fewer brain cells in the areas governing learning and memory. Even when they were no longer exposed to screens, the mice did not improve. “The effects on the brain were permanent,” Dr. Constantinou emphasized during the discussion after the documentary. At Akron Children’s, she saw increasing problems with sleep deprivation and obesity in children because of too much time spent with digital devices. Screens are also contributing to obesity in children because they are sedentary while looking at devices, she said. Father Andrew said there is a movement based on the second chapter of Genesis that says on the seventh day, God rested. That movement encourages fasting from technology on the Sabbath, he said. Father Aleksa said he and his family have a version of Tech Talk Tuesdays, as suggested in the film, when they discuss how to use new technology responsibly. They also have Friday game nights - to which the kids can invite friends - and a rule that there will be no cell phones during family trips and activities. 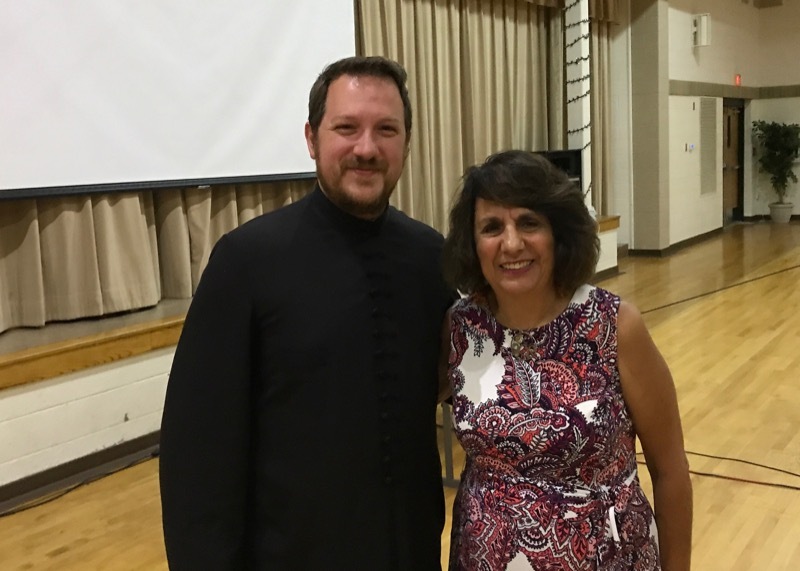 Dr. Constantinou said years ago, she and her husband made a rule that no one could do anything apart from the family after Divine Liturgy on Sundays. Instead, they would hike in the local Metroparks. “To this day, we hike as a family,” she said. Dr. Constantinou said that on October 1, the American Academy of Pediatrics will release a Family Media Use Plan that will make recommendations and provide tools for screen-free zones, time spent on devices, recommended breaks, device curfews, etc. It also warns of the dangers of technology and tells parents how to monitor children’s devices. The first step, he said, is to know the password to every device in your house. “If the kid changes it, that device goes away,” he said. Rev. Father Jerry Hall believes showing the documentary at his church was beneficial. Article by Barbara Mudrak, a retired teacher and journalist. She is a member of Holy Assumption Orthodox Church in Canton.